Part community living room, part art house, and part greenhouse, Parlor is an experimental hybrid retail concept integrating the work of local artists and designers into its form and function. An uplifting, sensory setting, Parlor invites the community to stop in, meet new people and experience an evolving collection of artwork. 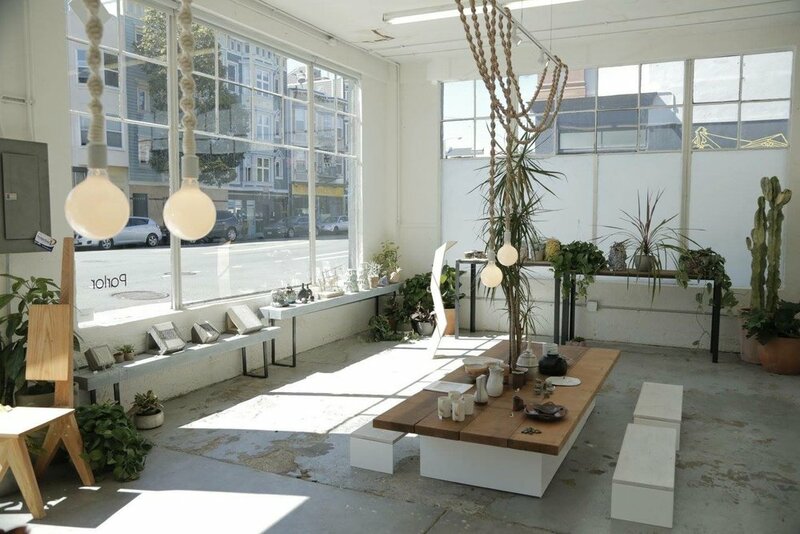 The spring-summer pop-up will feature a rotating selection of painting and sculpture, unique furniture, tableware, house plants and provisions. Much like Gordon Matta-Clark’s FOOD restaurant (SoHo, 1971-1974), Parlor is both a retail business and an artistic “intervention in an urban setting.” Parlor’s low-standing communal table encourages visitors to subtly engage with one another, overhearing fragments of conversation and stealing glances with strangers. Special events—such as live music, artist talks, or film screenings—cultivate more direct engagement. Oak + Fog is a design/fabrication workshop which combines the design sensibilities of artists Kioni Cho and Daniel Raimond to create thoughtfully handcrafted objects ranging from salvaged wood furniture to forged metal art. Their experiences as architect and blacksmith allow them to undertake more complex projects as well such as wrought iron railing and lighting design. All materials are carefully handpicked, and each project designed and built by the artists themselves, giving every piece their wholehearted attention and enthusiasm. Arianne Gelardin is curator at StoreFrontLab, an experimental exhibition space founded in 2011 by architect David Baker and Yosh Asato. A "small space for big ideas," StoreFrontLab supports conceptual and city-oriented projects that rely heavily on public dialogue and participation. Arianne also consults on the design and fabrication of public artworks for the San Francisco Arts Commission, facilitating production from proposals to architectural details. Working at the intersection of art, phenomenology, and sociology, Arianne's personal practice finds form through writing, happenings, and visual language.